Our frames are hand-made and hand-finished, and designed specifically to complement each particular artwork. We work in close consultation with collectors, sharing our expertise to achieve the best amalgam of moulding and finish. Frames may be finished in numerous ways. Water-laid gold or silver leaf on a gessoed ground; oil-laid gold, silver or copper leaf; metal alloy leaf in silver or gold; painted bronze or aluminium powder and burnished; veneers such as bird’s-eye maple, walnut, oak or elm burr (there are many others) and French polished; or any number of paint finishes. Or any combination of the above. The possibilities are endless, but with our guidance the choice need not be overwhelming. Our range of picture-frame mouldings is also extensive. Many are unique to The Rowley Gallery and available nowhere else. They include oak, ash, maple, cherry and beech, which are used when the integrity of the wood is to be preserved, and are finished with wax polish or clear lacquer. Other mouldings in pine, poplar or obeche, are used when the frame is to be gilded, laminated with a decorative veneer, or given a painted finish. 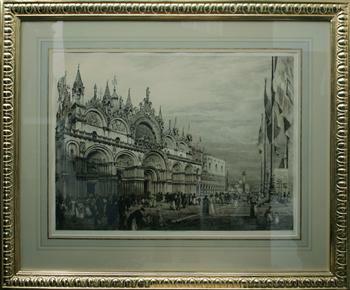 As well as being visually appropriate we understand that a frame must also serve to protect the artwork. We use only conservation grade materials that are stable, archival and reversible. We employ a range of glazing materials, from standard 2mm picture glass through to ultraviolet filter glass, non-reflective glass or acrylic/perspex. In most cases we use fillets or mounts so that the glass is raised and not touching the artwork. Other services include framing of mirrors; gilded & inscribed plaques; calligraphy; restoration of works on paper, oils on canvas, and restoration of frames; dry-mounting onto card, board or aluminium. We can also arrange for delivery and collection. Rarely are any two frames the same, since each one is a response to a particular circumstance, but to see some we prepared earlier please click Showroom. To see some of the methods we use please click Workshop. And just to show that a picture frame need not actually contain a picture - three views of Intemperie, an installation at the Fondation Maeght by Catalan artist Perejaume - an enclosure built of picture frames through which to view the surrounding artworks. G K Chesterton – author and former local resident.